June 10, 2014: Years ago, in 2008 and 2009 an eerie quiet descended on the sun. Sunspot counts dropped to historically-low levels and solar flares ceased altogether. As the longest and deepest solar minimum in a century unfolded, bored solar physicists wondered when "Solar Max" would ever return. They can stop wondering. "It's back," says Dean Pesnell of the Goddard Space Flight Center. "Solar Max has arrived." Pesnell is a leading member of the NOAA/NASA Solar Cycle Prediction Panel, a blue-ribbon group of solar physicists who meet from time to time to forecast future solar cycles. It's not as easy as it sounds. Although textbooks call it the "11-year solar cycle," the actual cycle can take anywhere from 9 to 14 years to complete. Some Solar Maxes are strong, others weak, and, sometimes, as happened for nearly 70 years in the 17th century, the solar cycle can vanish altogether. Pesnell points to a number of factors that signal Solar Max conditions in 2014: "The sun's magnetic field has flipped; we are starting to see the development of long coronal holes; and, oh yes, sunspot counts are cresting." Another panelist, Doug Bieseker of the NOAA Space Weather Prediction Center, agrees with Pesnell: "Solar Maximum is here …. Finally." According to an analysis Bieseker presented at NOAA's Space Weather Workshop in April, the sunspot number for Solar Cycle 24 is near its peak right now. They agree on another point, too: It is not very impressive. 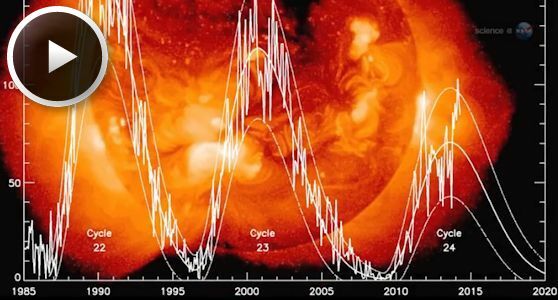 "This solar cycle continues to rank among the weakest on record," comments Ron Turner of Analytic Services, Inc. who serves as a Senior Science Advisor to NASA's Innovative Advanced Concepts program. To illustrate the point, he plotted the smoothed sunspot number of Cycle 24 vs. the previous 23 cycles since 1755. "In the historical record, there are only a few Solar Maxima weaker than this one." 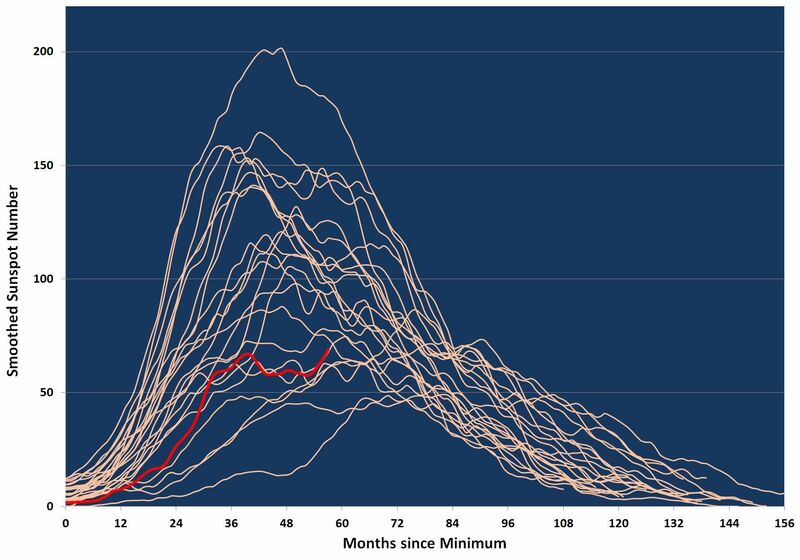 As a result, many researchers have started calling the ongoing peak a "Mini-Max." This plot prepared by Ron Turner of Analytic Services, Inc., shows the smoothed sunspot number of Cycle 24 (red) vs. the previous 23 cycles since 1755. Pesnell believes that "Solar Cycle 24, such as it is, will probably start fading by 2015." Ironically, that is when some of the bigger flares and magnetic storms could occur. Biesecker has analyzed historical records of solar activity and he finds that most large events such as strong flares and significant geomagnetic storms typically occur in the declining phase of solar cycles—even weak ones. Indeed, this "Mini-Max" has already unleashed one of the strongest storms in recorded history. On July 23, 2012, a plasma cloud or "CME" rocketed away from the sun as fast as 3000 km/s, more than four times faster than a typical eruption. The storm tore through Earth orbit, but fortunately Earth wasn't there. Instead it hit NASA's STEREO-A spacecraft, which recorded the event for analysis. Researchers now believe the eruption was as significant as the iconic Carrington Event of 1859—a solar storm that set telegraph offices on fire and sparked Northern Lights as far south as Hawaii. If the 2012 "superstorm" had hit Earth, the damage to power grids and satellites would have been significant. It all adds up to one thing: "We're not out of the woods yet," says Pesnell. Even a "Mini-Max" can stir up major space weather—and there's more to come as the cycle declines.